As we are just days away from Christmas, I thought it might be fun to share some short, out-of-the-ordinary stocking stuffers about Disney and Christmas. Author Bob Thomas recalled that Walt Disney enjoyed playing Santa Claus for his friends so much that he maintained a file of index cards in boxes of hundreds of children of his personal friends, members of the press, studio workers, film executives, and more. Each child got gifts of Disney character merchandise, primarily one large important item plus a few little ones, each individually wrapped. The detailed index cards recorded what each child got each year so there would be no duplication. Those cards in their wooden boxes are still in the possession of the Disney Archives. The card for actor Fred MacMurray lists his two daughters, Katherine and Laurie. When she was 6 years old, Katherine received a Bambi doll, Owl candle, and a picture game. When she was 8, she got a Mary Poppins doll, picture kit, Tinker Bell and a pendant. When she was 9, Santa Walt brought her a Snow White watch and a Mary Poppins hand puppet. When she was older, she got a copy of the original Art of Animation book by Bob Thomas. Walt's secretaries were the real Santa's elves responsible for putting together all these packages for the children. Beginning early in November, they were often kept busy right up to a few days before Christmas in a special room in the studio warehouse. Walt dropped in daily to inspect the packages and make sure that his directions were being carried out. The gifts continued until the child reached the age of 12, then he or she was usually dropped from the list and just received a Disney Studios Christmas card instead each year. 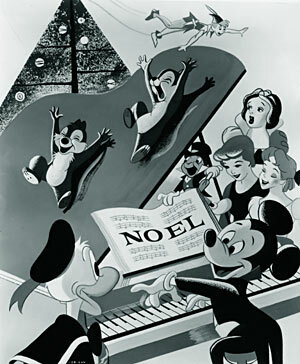 Walt made sure there was an annual Christmas party at the Disney Studios each year. The party featured not only the usual food and beverage, but some form of live entertainment like the Firehouse Five Plus Two band. In addition there was an appearance by Santa who handed out presents to the children and several Disney cartoon shorts were shown. Another long tradition that Walt initiated was a Christmas party for the young hospital patients, as well as for the children of hospital employees, at the St. Joseph's Hospital across the street from the Disney Studios. 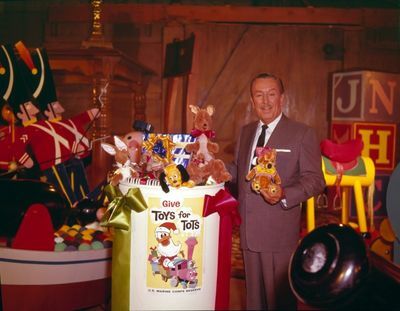 Walt was one of the original founders of Toys for Tots. Walt helped with the groundbreaking for the facility in 1943 and then later for the groundbreaking of its new wing in 1950 and was the patron who had artist Mary Blair create a mural for the St. Joseph's Nursery. For the St. Joseph's children's Christmas party that was produced for many years by voice artist Candy Candido (the voice of Indian chief in Peter Pan and some of Maleficent's goons in Sleeping Beauty), Walt would also supply an entertainment show including in some years the Mouseketeers, as well as, of course, toys and a special visit from Santa. In early 1960, Walt joined with a group of more than 50 civic leaders from Orange County including Walter Knott of Knott's Berry Farm, to raise the funds necessary to build Orange County's Children's Hospital of Orange County, nicknamed CHOC. Walt had artist Bob Moore create the logo and mascot, CHOCO the Bear who is still used today. Walt also helped with Christmas parties for the children there as well. The facility officially opened in October 1964 and was connected to the Sisters of St. Joseph's which is another reason Walt was so personally involved. Of course, Walt was also one of the founding sponsors for the nationwide Toys For Tots that began in 1948 and came up with the red toy train logo for the organization. Walt always associated toy trains with Christmas. While he was alive, there were Toys for Tots collection barrels in every land at Disneyland during the holiday season. It was Christmas that inspired the creation of Scrooge McDuck, Donald's Duck miserly but enormously rich Duckburg uncle. For a December 1947 comic book, talented writer and artist Carl Barks created the character of Scrooge McDuck for a Donald Duck story titled Christmas on Bear Mountain (Dell Four Color No. 178). 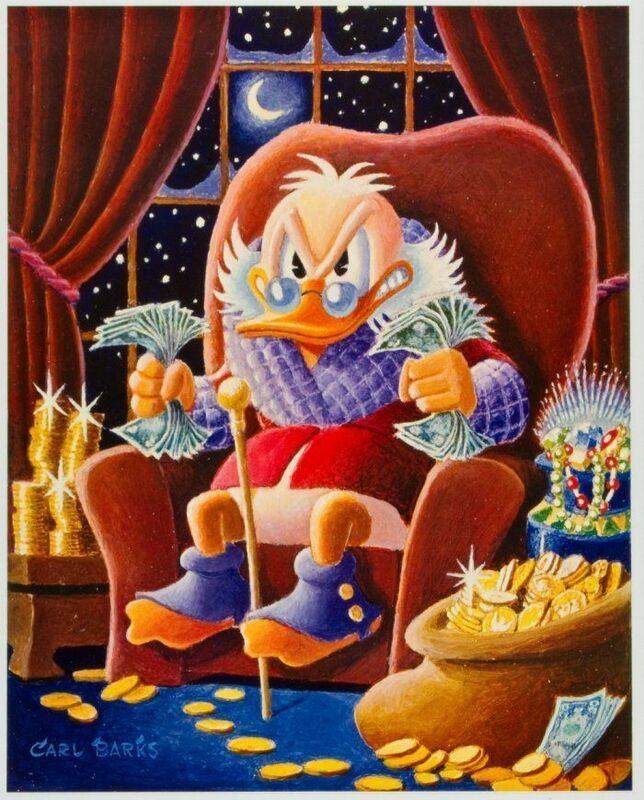 The name of the penny-pinching uncle of Donald Duck, Scrooge, was inspired by the miserly character from Charles Dickens's classic A Christmas Carol. Scrooge McDuck actually appeared as Ebenezer Scrooge in a 1975 storytelling record album which was later adapted as the theatrical featurette Mickey's Christmas Carol in 1983. It was so well received that it inspired the creation of the DuckTales syndicated animated television show. Barks had Scrooge appear in another classic Christmas comic book story in 1952, A Christmas in Shacktown (Four Color No. 0367) where Scrooge's Money Bin falls into an almost bottomless pit but as a result some poor children in the Duckburg slums get a happy holiday thanks to the ingenuity of Donald Duck's nephews. Barks had Scrooge appear in several other Christmas themed stories, including The Thrifty Spendthrift, Christmas Cheers, Christmas in Duckburg and Submarine Christmas where Scrooge hunts for sunken treasure on Christmas Eve with Donald Duck and his nephews. Inadvertently, Christmas was the source for Goofy's memorable yell ("yaaaaaaa-hoo-hoo-hoo-hooey!!") as he falls off mountains or soars unexpectedly into the air. The talented Pinto Colvig provided the voice for Goofy and his distinctive laugh but was not the originator of Goofy's famous yell. Walt and his family sometimes spent the Christmas holidays skiing at the Sugar Bowl Ski resort in Northern California. Walt was friends with the founder of the resort, Austrian skiing champion and instructor Hannes Schroll. Schroll re-named one of the mountains at the resort "Mount Disney" to honor Walt. Walt even filled in as a bartender one Christmas at the resort and was unrecognized by the crowd. As a favor to Walt, Schroll supplied the yodelling in the Goofy cartoon The Art of Skiing (1941) and was the first person to do that classic yell that has become so iconic. Over the years, there has been some debate about whether Schroll was ever paid for that iconic yell or his yodelling. In later years, Walt spent his Christmas holidays with his family at his Smoke Tree Ranch vacation home in Palm Springs. He did consider creating a unique ski resort, Mineral King, but died during December 1966 before plans could be completed. Ward Kimball was a legendary animator and Imagineer for the Disney Company. "I used to dress up as Santa for my kids at Christmas. We made quite a ceremony out of it where someone on the roof would pound on the roof and yell, 'Now Dancer, Now Prancer...' and all the kids would storm into the living room just in time to see me dressed as Santa at the chimney with my back turned toward them. I would then turn around and hand out presents. "This got to be such a big deal that other neighborhood moms started coming by and pretty soon there was a whole gang of kids and parents. So one way I put a stop to this was by giving out as Santa condoms to the men one Christmas as presents. "Years later when my daughter Chloe was old enough, [my wife] Betty complained that it was a shame that Chloe had missed out on all this. So under duress, I agreed to do it one more time. But I always liked twists so this time instead of a Santa costume, I rented a gorilla outfit and drove home wearing it. "Bill Peet, the storyman, told the other animators that he was going to phone the police and tell them he was a local animal handler and that a gorilla had escaped and was in the vicinity of my home. But Peet on the way home apparently got roaring drunk and forgot all about it and when he did get home, he collapsed on the front lawn and his wife turned on the sprinklers to try and sober him up before he came into the house. "Well, at the Kimball home, there was the sound of reindeer on the roof. The kids rushed in and I turned around in the gorilla costume with arms raised and growling. It scared Chloe and even today she doesn't like me to tell the story. The dog got upset at me, too, and chased me out of the house and there I am panting and sweating in a neighbor's house where I peel off the costume." One of the holiday traditions in my family was watching on television From All of Us to All of You, the festive episode of the Disney weekly television show. A charismatic Jiminy Cricket was surrounded with colorfully illustrated Christmas cards from the Disney characters (back in the days when people actually sent physical Christmas cards in the mail and displayed them on the fireplace mantel and tables or hung them around the living room) that transitioned into excerpts from Disney's classic cartoons. That was a pretty big deal, because in the days before videotapes – much less Blu-ray discs and streaming – that was the only opportunity to see these animated treasures. And, of course, Disney and Christmas have always seemed to be magically linked so this was a natural topic for the weekly television series. In 1983, it was repurposed and expanded to 90 minutes and re-titled A Disney Channel Christmas. The original episode was directed by Jack Hannah who had been responsible for writing and directing many of the classic Donald Duck theatrical cartoons. From All of Us to All of You was a seasonal favorite in the Korkis home. Jack told me: "We used an awful lot of old animation stuff in the making of these shows to help with the costs. You'd find a theme like going on vacation or Christmas and tie a couple of short segments around a little new animation. "One of my favorite shows and one that I felt came off really well and got a good reaction was From All of Us To All of You. Unfortunately, they have cut it up so much over the years to promote their latest film that I can hardly recognize it anymore as mine," he said. The show first aired December 19, 1958 on ABC and starting with its re-airing in 1963, the final segment was always reconfigured to showcase an excerpt from a current or upcoming Disney animated feature film. In order to accommodate that change, the original opening and closing were cut completely which was a criminal shame. Walt Disney during his original introduction was shrunk to the size of a cricket by Tinker Bell's magic because Walt said that Mickey Mouse and Jiminy Cricket insisted he appear "cricket-size" because "Christmas is bigger than all of us". Walt explains that the show is going to be put on by "our cartoon critters" but takes the time to wish home viewers "on behalf of the human members of our staff" a happy Christmas. Standing on the fireplace mantel, Walt introduces Jiminy and Mickey and turns the show over to them. Jiminy explains, "One of the nicest things that can happen this time of the year is to receive Christmas cards from your friends. Our gang would like to present their cards and through them share some memorable moments." At the end of the show, Jiminy wished everyone a "Merry Christmas from All of Us to All of You" while the camera showed a "From All of Us" card on top of the fireplace mantel over a roaring fire, Christmas decorations and a Christmas tree as Tinker Bell waved her wand to create a big flash of light to close the show. Like many of the episodes that featured compilations of classic cartoons, new animation (especially Jiminy interacting with the Christmas cards) to connect things was created especially for the show by Les Clark, Volus Jones, Al Coe and Bob McCrea. Yale Gracey, Ray Huffine and John Hench were involved with the art design. In fact, Hench designed many of the Disney Studio Christmas cards so it is likely he designed most if not all of the cards shown in this show. The catchy title tune was composed by lyricist Gil George (the pseudonym of Disney Studio nurse Hazel George) and award-winning composer Paul Smith who she was living with, as well as collaborating on some memorable tunes. The song was released that same year as a single on Disneyland Records label. The show was written by Albert Bertino and Dave Detiege and directed by Jack Hannah and was later rerun on December 25, 1960, and December 22, 1963. That 1963 edition had a different ending with Jiminy Cricket explaining: "Of course, no Christmas would be complete without a surprise gift" so he shows a preview scene from the then-new animated feature, The Sword in the Stone. That new 1963 edited version without Walt was later rerun in 1967 (publicizing Jungle Book instead of The Sword in the Stone), 1970 (The Aristocats), 1973 (Robin Hood), 1977 (Pete's Dragon), 1979 (Corn Chips cartoon included) and 1980 (Aristocats again for the re-release). As the closing credits to the episode stated "This special holiday program has been made possible by the combined talents of the entire Walt Disney Studios. It is our way of saying 'Merry Christmas from all of us to all of you'." Interestingly, the show has become an annual viewing tradition overseas. Since 1959, the viewing of this program is a sacred holiday event in Sweden where it is known as Kalle Anka och hans vänner önskar God Jul: "Donald Duck and his friends wish you a Merry Christmas." Kalle Anka has aired without commercial interruption at the same time in the afternoon on Sweden's main public-television channel, TV1, on Christmas Eve (when Swedes traditionally celebrate the holiday) since Christmas 1959, one year after it first aired in the United States. At the time it was first shown, Swedes were just starting to own televisions. "You couldn't have done this in 1970," said Charlotte Hagström, an ethnology professor at Lund University and archivist of the university's Folk Life Archives. "It had to be 1960 when television was new." The fact that there was only one channel in Sweden until 1969 and only two—both public-service stations run by Sweden's equivalent of the BBC—until 1987 helped, too. As did the fact that, for years, Christmas was the only time when Swedes could see Disney animation — or any American cartoons — on television so it made it a special treat. The special is pretty much the same every year, except for the live introduction by a host (who plays the role of Walt Disney from the original Walt Disney Presents series) and the annual addition of one new clip from the latest Disney-produced animated feature, which TV1's parent network, SVT, is contractually obligated by Disney to air in order to run the show. It is one of the three most popular television events of the year, with between 40 percent and 50 percent of the country tuning in to watch. In 2008, the show had its lowest ratings in more than 15 years, but was still taken in by 36 percent of the viewing public or roughly 3,213,000 people. Lines of dialogue from the show have been memorized by families who repeat them during the broadcast and some of these have become "catch phrase" references in everyday conversation. Stockholm's Nordic Museum has a display in honor of the show in an exhibit titled "Traditions." Documented in the exhibit is that each time the network has attempted to cancel or alter the show the resulting public outcry has been vocal, swift and fierce with the network bombarded by negative press and actual physical threats. Most families plan their entire Christmas around Kalle Anka, from the Smörgåsbord at lunch to the post-Kalle visit from Jultomten. Over the last half-century, the characters and familiar animation clips have become as much a part of the holiday as the Christmas tree. "At three o'clock in the afternoon, you can't to do anything else, because Sweden is closed," stated Lena Kättström Höök, a curator at the Nordic Museum who manages the "Traditions" exhibit. "So even if you don't want to watch it yourself, you can't call anyone else or do anything else, because no one will do it with you." The show reran unchanged every Christmas until 1966. In 1967, they started replacing segments, and they continued to make small changes more or less every year, until 1983. Today's version is pretty much the same as the 1983 show. This book features all the Disney Company corporate Christmas cards beginning in 1931 and with lots of additional explanatory text. Kurtti is always the best when it comes to sharing Disney history. All the special Disney Christmas comic strips that ran in newspapers from 1960-1997 except for 1986 that featured one based on Song of the South. Lots of classic Disney Christmas comic book stories by Carl Barks, Walt Kelly, Floyd Gottfredson, Daan Jippes and more. Yuletide tales of Walt, the parks, animation, comic books and more. Or track down the long out-of-print 1978 book Walt Disney's Christmas Treasury (Abbeville Press) which is very skimpy in terms of text, but filled with lots of wonderful illustrations from comic book stories to stills from cartoons, and more. A very Merry Christmas and Happy Holidays to all of you! Korkis did not mention the early cast member parties at Disneyland, where every child leaving received a gift. I still have my Tinker Bell necklace that I received in 1957.